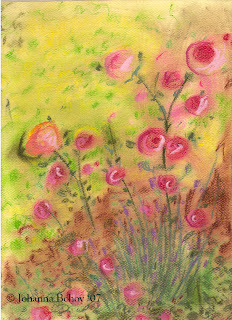 Pastel & pencil, 6" x 9"
Let' em loose and they'll take over the gardens. 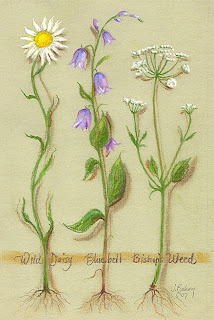 I love the charming blue bells, and the happy, cheery daisies, but let me strangle the white capped Bishop's Weed that chokes everything in sight. Sun, and warm, perfumed air. The swans are out. 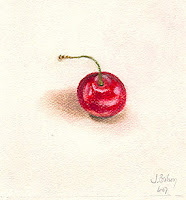 Pastel, 9.75" x 8.5"
just a bowl of cherries? is it one cherry in a bowl? Red and ready to eat. 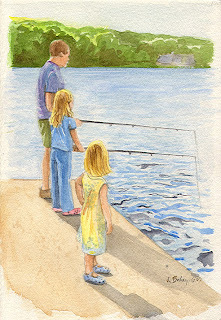 GrandPoppi teaches his girls' girls to fish. The lake shimmers, his eyes twinkle, they sparkle. the work, the stress, the politics. I have been unable to do my daily paintings for the last month, except for a few, for a number of reasons-- but I will be back to the "painting board" this week. 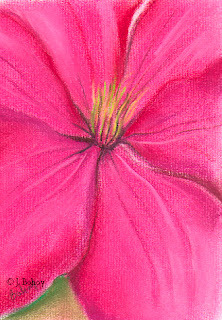 Look for my paintings! Online art gallery members to produce 2,000 original paintings in 30 days, from June 15 to July 15! 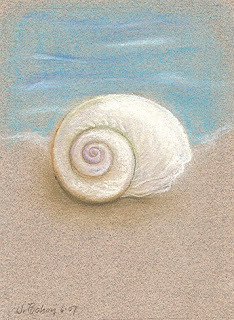 The artists of the Daily Painters Gallery have been busy. 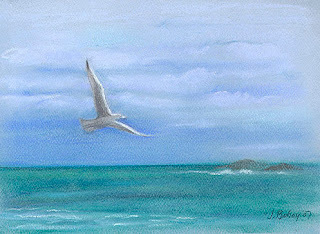 Since September 2006, they've posted over 10,000 original paintings to their online gallery at DailyPainters.com. 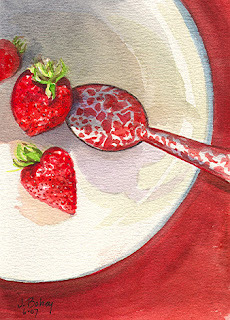 From June 15 to July 15, 2007, they will be attempting a new group record: 2,000 paintings in 30 days. 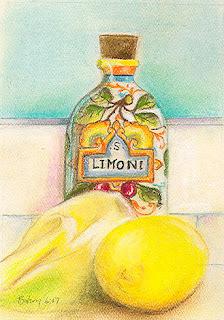 DailyPainters.com was founded in 2006 by artist Micah Condon and has since grown to include over 120 artists. 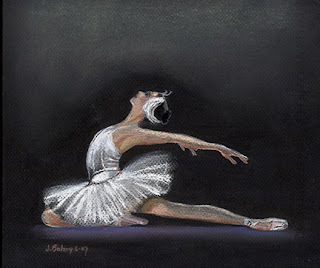 DailyPainters.com artists have been featured in The New York Times, USA Weekend Magazine, The Boston Globe, Art Business News, Domino Magazine, The Washington Express, Wired Magazine, and more. With flowers bursting and overflowing my gardens- it is overwhelming. I need to focus for a moment on one- like Georgia O'Keefe. The May greens bow to new June rosebuds.